Three weeks ago we welcomed baby Ryan into our family. While I am enjoying snuggling with him and spending time with my other two kids, I have some special guest bloggers scheduled to share some great posts with you! Today I am so happy to have Carolyn from The Pleasantest Thing sharing a great post with us about a fun Thanksgiving craft for your table. Welcome Carolyn! I wanted to come up with an project to get my kids thinking about Thanksgiving, and all the family sharing the holiday together. Place cards for everyone at the meal seemed like a good way to start. I folded cardstock and wrote names for each family member who will be with us for Thanksgiving dinner. 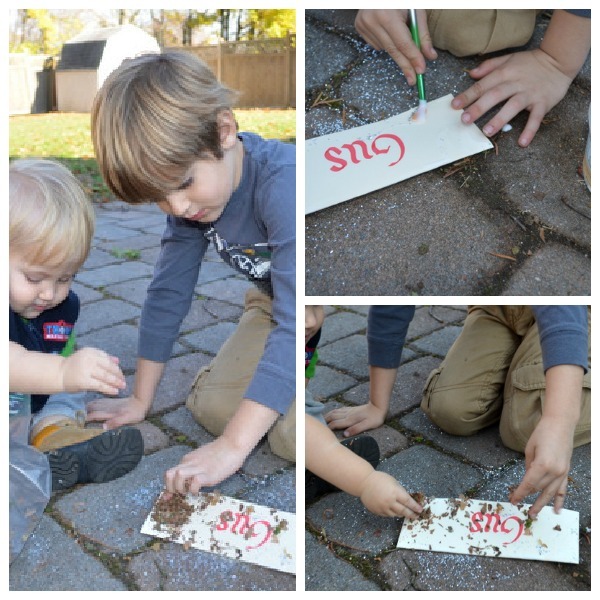 Then we gathered the driest leaves off the ground, crumpled them up into a ziplock bag, and added some glitter. After my 4 1/2 year old painted glue around the outside of the cards to create a border, he and my 1 year old sprinkled the crushed leaves on the glue. Then they shook the excess leaves off the cards. As we made the cards, we talked about each family member, and favorite stories about them. We started using ours right away, so it's possible we will have to make another batch before Thanksgiving comes! Thank you Carolyn!! I love the sparkles. What a fun activity to do with your kids at this time of year. 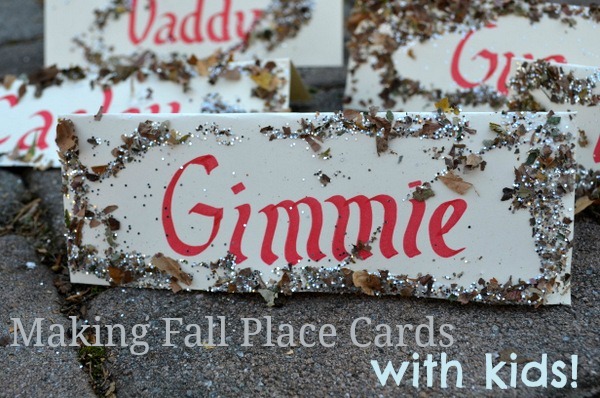 For another twist on this activity, you might enjoy these Thanksgiving Table-top Name Cards via This Reading Mama! What other simple Thanksgiving crafts and activities are on your list to try this week? Carolyn is the writer at The Pleasantest Thing blog, and a mom to two boys, ages 4 1/2 and 1. She believes play is critical to child development. Her blog focuses on learning and developing imagination through adventure, play, reading, and nature. You can also join in the fun by following her blog on Facebook, Pinterest, or Twitter.